Income tax rates have been reduced by the tax act of 2018 and so we don’t need to focus on tax savings like we did in the past. True or false? We know the right answer but folks seem a bit more lax about finding tax savings. Current top tax rates range from 10% up to 37%. The broadest range is for taxable income, we’ll use married filing jointly, of 24% top rate for those with taxable income between $165,000 and $315,000. Dual incomes put a high percentage of the population in that category. That is a reduction over previously as the folks in that range were either 28% or 33%. To understand how this impacts you, it is important to know that we pay taxes in layers starting with 10% and moving up to one’s top bracket. In our example, that is 24%. So every dollar of income you earn in that bracket is taxed at 24%. Conversely, sheltering a dollar in some fashion saves 24% and that is a significant improvement in the bottom line for you. Consider the basic decision of putting another dollar in one’s contributory retirement plan, most commonly that’s a 401K. The question we ask ourselves is, “Can I afford to take a dollar from my current consumption and put it in my 401K?” Well, that question is erroneous. If you take a dollar from your gross income and use it to buy consumer goods, you must first pay taxes – in your top tax bracket. So $1.00 becomes $0.76 available to spend after tax. By contrast, putting a dollar in your 401K carries 100 cents of that dollar into your personal retirement savings. Then 100 cents continues to potentially earn income or experience growth for all of the years until it is withdrawn and used for retirement. You will pay taxes then, but in the meantime, you have experienced an interest free loan from the U.S. government equal to all the tax you would otherwise have paid. Now, before you dismiss this as information you already know, ask yourself a reality-check question. Am I contributing the maximum allowed to my 401K? Is my spouse? If not, go back and read this paragraph again. That is only one example of the tax savings that is available to you. Putting money into a 529 college savings plan for your children and grandchildren can turn all of the earnings tax free when used for college expenses. Have you done a planning schedule that will show you how much you should put away for each child? If not, why not? Don’t you want that tax savings? By prefunding education, you put the textbook principles of time and tax savings to work for you. Avoid paying full sticker price for college with this very accessible tax savings and accumulation strategy. Shifting the tax burden on appreciated assets to a lower tax bracket family member or charity is also a tax saving strategy. Selling an appreciated asset and then giving cash to a family member or charity runs it through your top tax bracket. But giving it to a lower tax bracket member to sell for their use may lower the top tax bracket to, for example, 10% from your 24%, thus saving 14% of capital for the family. If it is given to a charity, you save the entire 24% because the charity has no tax bracket. There is so much more, and all of this was meant to spark your thinking toward seizing these benefits and not as specific recommendations. Sometimes people wonder if they can afford to divert cash flow from consumption to retirement and college savings. That is where our planning schedules come in. Most people can plug leakage in their expenditures to find cash for savings, and it doesn’t have to hurt. Often, we spend too much for too little benefit and can easily redirect those funds to a more productive use. If you talk with us now, we can evaluate your situation relative to your goals and unique circumstances. We’ll work with you and your accountant to come up with the investment and tax reduction strategy that is structured to best fit your family’s goals and needs. We can potentially make this time next year much happier due to an appropriate tax reduction strategy that we implement now. 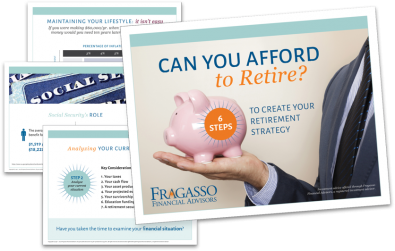 Download our step-by-step guide to creating your retirement strategy!